Need Different Size or Design?? 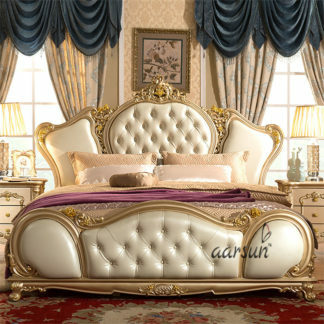 Aarsun woods promotes to you handcrafted wooden bed for home. .The wooden bed is made from premium quality teak wood with traditional carving and finishing. The effortlessly stylish headboard and foot-board are decorated with splendid carving design. This wooden bed is strong and available with huge durability. Traditional hand carving designs in all their essence are utilitarian and carefully crafted to enhance the life of the furniture. This design bed will add to the decor of any bedroom. A well designed handmade Wooden bed should provide a restful sleep, pleasing appearance, appropriate functionality and durability for generations. It is hand crafted from teak wood by finest of artisans. 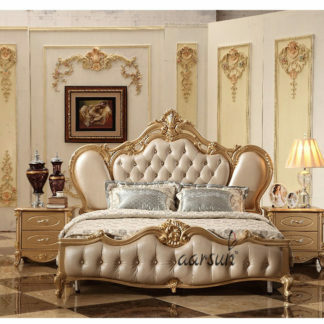 This bed will transport you to the luxurious times of the eras gone by, and remind you of everything that you have read of the earlier decades. The bed is available in three sizes – single, queen and king ,you can also select the kind of wood and the type of finish you want for the bed from a range of options that include natural, walnut and dark walnut. So, lay your hand on this bed to add a touch of evergreen elegance to your room. Augment the look and feel of your bedroom decor with this impeccably crafted bed. The wooden beds are carefully and lovingly designed with your comfort and the environment in mind. Our wooden beds are made to order using traditional carpentry techniques, ensuring a unique piece of furniture that is both beautiful and extremely strong, yet easy to assemble in your home. This Wooden bed is long lasting, durable and very strong as it is made from one of the best quality teak wood. Besides giving maximum comfort, this furniture will bring a touch of class, style and grace. Looking For a different material design in Wooden Beds, have a look at Traditional Wooden Bed,also in case you require fine carving in natural Finish, go for Handmade Wooden Beds .